The major achievement of the bill is to the increase in fuel standards to an aggregate of 35 miles per gallon, which means that in the year 2020 we’ll catch up to the rest of the world in fuel efficiency. That is, if the rest of the world stood still over the next 12 years. An nice side benefit is that Congress did agree to fund geothermal R&D to the tune of $95M, which is quite an improvement from $0. So there may be a baby step that this law provides, but on balance, it doesn’t really accomplish much. Geopressured and oil and gas field co-produced resource production: Clean, renewable geothermal energy can be produced with existing natural gas and oil and gas fields. These uses could revolutionize both the geothermal and the fossil fuel industry. Industry-coupled drilling: This program pairs the federal government with geothermal developers to reduce drilling risks and improve drilling precision. Exploration and drilling pose some of the most difficult risks for new geothermal projects and can add significantly to project costs. be produced using advanced technology. A sustained research and development effort is needed to move towards this goal. Center for geothermal technology transfer: Such a center, which currently does not exist, is critical to developers seeking information about geothermal prospects and technology advances. International Geothermal Collaboration: DOE and US AID are directed to support international geothermal development, particularly related to the African Rift Geothermal Development Facility, Australia, China, France, the Republic of Iceland, India, Japan, and the United Kingdom. Karl Gawell from the Geothermal Energy Association has a nice write-up of the bill at the GEA website. So it’s not all bad news, but still, the PTC longterm extension and RPS omissions are glaring. After a hard-fought battle on the political playing field, the renewable energy industries have suffered a difficult defeat. The Senate voted yesterday evening on an Energy Bill that left out the investment and production tax credits and a renewable portfolio standard (RPS), avoiding a Presidential veto but dramatically reducing the role of renewables in Congress’ energy plan. The Bill passed by a vote of 85-12. It now goes back to the House for approval and then to the President to be signed into law. The White House issued a statement yesterday saying that it would accept the Bill. The House of Representatives passed the first major increase in fuel economy standards in more than 30 years with a 235-181 vote. The energy bill requires automakers to raise their average fuel economy standard by 40 percent to 35 miles per gallon by 2020. The current standard — 27.5 mpg for cars and 22.2 for trucks –was passed in 1975. The bill also includes a mandate that electric utility companies generate 15 percent of their energy from renewable sources of energy such as wind, biomass or solar power by 2020. Rep. Joe Barton, R-Texas, argued the “renewable energy standard” leaves out some technologies like clean coal and hydrogen, and is “almost impossible to meet” by most states. While not reported in this story, the bill also extends production tax credits until 2012, which will stimulate renewable power project development as it reduces the risk to finance these projects. The Senate will likely approve the bill and it will then face a veto by lame-duck President Bush. As you can see, the top 50 carbon emitters are plotted at a global level and #49 Navajo Power Plant is selected showing it produces 17.6 GWh of power along with 19.9 M tons of CO2 emissions per year. One of the more interesting things they track is intensity, or pounds of CO2 emitted per megawatt-hour of electricity produced. The data in CARMA are compiled from numerous sources. 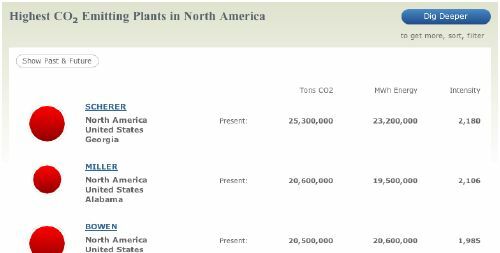 Emissions data for thousands of power plants in the U.S., Canada, the EU, and India come from official reports. Other data are derived from information provided by power sector analysts, the International Energy Agency, the U.S. Department of Energy, the Environmental Protection Agency, and a host of geographic databases. So while it might not be 100% accurate, it’s credible and trackable and certainly better than what existed before. The aggregations and zooming are very useful and it enables a researcher to determine not only the largest contributors to CO2 emissions, but also the most intense (or least efficient) as well as the lowest producers and most efficient power plants. One thing that may be surprising to people is that the largest electric power plants on the planet are also among the lowest CO2 emitters – gravity hyrdo-generation facilities. For instance, the largest plant on the planet is ITAIPU in Brazil, an 8 GW hydo facility producing over 63 GWh of power per year and zero CO2. In fact, of the 15 largest power plants globally (4 GW and over) – ten are zero CO2 emission. 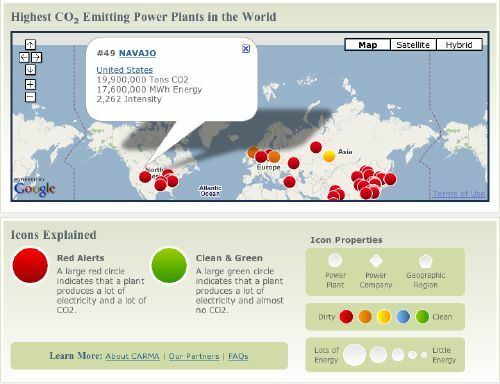 If you’re interested in knowing more about power plants, their emissions, and impact, we encourage you to visit CARMA.